2018 went out of its way to show what our climate change future is likely to look like. Throughout the year, extreme weather events around the world destroyed lives and livelihoods costing billions in economic losses and public resources. Climate change threatens the natural systems that our lives and economies depend on, so it is simultaneously an environmental, economic, and developmental issue. But it is also an equity issue. If you’re poor, female, or otherwise marginalized, the risk of losing your already limited assets, livelihood, and potentially your life is heightened by climate change. Failure to address this extra vulnerability as we tackle climate change will deepen existing poverty and inequality. 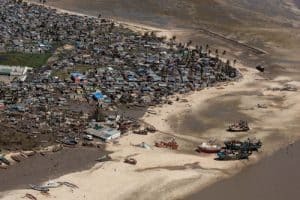 An aerial view of a neighborhood affected by Cyclone Idai on March 24, 2019 in Beira, Mozambique. Credit: Andrew Renneisen—Getty Images. The global community must reduce the emissions that cause global warming (mitigation) and protect vulnerable people, communities, and sectors from extreme weather events; help them recover; and build resilience to unavoidable climatic changes (adaptation). An adequate response will require massive investments of public and private money, with estimates topping hundreds of billions of dollars per year. It’s clear that climate change will be one of the greatest public finance challenges for the foreseeable future. Governments will play a substantial role in both mitigation and adaptation. Some of this will be through regulations and other policies, but most actions will be through public finance systems, either through revenue policies that indirectly influence investor and individual behavior or direct spending on infrastructure, programs, and services. Governments don’t make these decisions in a vacuum, and those opposing effective climate change action, particularly on mitigation, are politically very powerful. The coal and oil industries employ lots of people, provide relatively cheap energy, and pump massive amounts of money into political campaigns, all ensuring their influence. Effective civil society engagement in climate-related budgeting is critical to countering this influence and avoiding the fiscal impacts of climate disasters and misguided investments. Civil society organizations (CSOs) and others outside government have an essential role through effectively advocating for and monitoring budget policies that both address climate change impacts and build the resilience of those who are poor and marginalized — and stopping those that don’t. Given the massive amount of financial resources that will be mobilized to respond, climate change may turn out to be our greatest opportunity to develop sustainable, equitable, and resilient societies. The road leading to this vision, however, will not be a straight one. Most efforts to respond to climate change will have winners and losers. Who will win or lose will be determined largely by how actions are designed, financed, and implemented. Last fall hundreds of gilets jaunes (or yellow vests) protesters hit the streets of Paris and other French cities in massive demonstrations against a “carbon tax.” This fuel tax increase was a government effort to use fiscal policy to encourage people and businesses to cut their consumption, reducing France’s emissions. However, the government had failed to recognize and address the negative impact the energy tax hike would have on those already struggling. As the opposition grew, the government was forced to drop the increase. Carbon taxes have proven effective in reducing emissions, but they are regressive, often forcing poor and low-income people to choose between energy and other essentials. This isn’t a “developed world” phenomenon, fuel tax increases have led to recent widespread protests in such countries as Kenya, Nigeria, and India. Though these increases were not related to climate, the resulting protests provide an important lesson for those planning to use fiscal policy to address climate change. There’s another approach. At the same time as demonstrations in France, the Canadian government enacted a carbon tax with little opposition. The Citizens Climate Lobby had proposed a “revenue neutral” carbon tax that returns nearly all of the proceeds back to individuals, offsetting the potential negative impact of the tax. Their proposal was reflected in the design of the enacted tax. The message for government is clear: failing to understand the equity component of climate change —and to engage citizens and civil society in decisions on climate actions — can lead to not only poor choices but also political upheaval. Climate-related public finance policy making, execution, and audit takes place within national and subnational climate change and development bodies; line, planning, and finance ministries; legislative sector and public accounts committees; the supreme audit institution; and state, provincial, and/or local government units. All these are potential spaces through which CSOs, directly or through strategic relationships, can influence policy choices, monitor whether public money for climate action is spent according to plans and has the intended impact, and hold the government to account when it falls short. We’re already starting to see a growing number of promising cases of how civil society, government, and others are engaging in policy processes to strengthen climate finance accountability. Five counties in Kenya, along with CSO support and partnerships with ward communities and the National Drought Management Agency, set up devolved climate funds that are partially funded through mandated annual budget allocations, and that engage communities in setting priorities and allocating funds. In the Philippines, the Institute for Climate and Sustainable Cities (iCSC), along with other CSOs, engaged both the national government and the parliament to strengthen the integration of climate actions into budgets, establish new accountability bodies, and promote a centralized climate finance monitoring system for financial flows and program implementation. In Bangladesh — where the government generally resists civil society input, particularly on public finance — a broad coalition of environmental think tanks and advocates, social justice groups, and the Citizens Budget Movement was able to get the ear of the government on its response to the proposed 2018-19 climate budget. The government expressed interest in several of their recommendations, including one on a joint government-civil society task force on climate finance accountability. These examples demonstrate the potential for and value of effective co-governance in climate finance, bringing in a range of civil society and international actors, including those with technical skills, legitimacy with communities and the government, and the relationships that can facilitate engagement. Still, this is a new field, and most of the examples are nascent, experimental, and localized. How might this field evolve in ways that support co-governance at scale across countries and at all levels of government? One recent example demonstrates the kind of decisive, significant breakthroughs that can emerge from a co-governance model. In January 2019 Germany’s Exit Coal Commission approved a proposal to end coal-fired energy production by 2038. As in most countries, coal is politically powerful, provides lots of jobs, and generates relatively cheap energy. Shutting it down will not be easy or painless. Thus the proposal includes €40 billion to compensate affected workers, companies, regions, and consumers. While the civil society environmental groups on the commission would have liked a more aggressive timeline for the phase out, all but one approved the package. This was very strategic. The proposal’s compensation package is seen as essential to counteracting the growing popularity in coal-producing states of a populist party planning to run in upcoming regional elections on a platform opposing climate change action. When political realities trump (no pun intended) ideal climate action, it may be more expedient for CSOs to take the incremental step in the right direction rather than drawing a line in the stand and risking a more hostile political environment for continued progress. The next task for civil society will be to monitor the disbursement of approved compensation to ensure that it reaches those most impacted. While addressing climate change will require significant public funds, it would be a mistake to assume that these would be “new” funds on top of current budgets for public goods and services. The harsh reality is that climate-driven increases in costs, e.g., a jump in cases of malaria, will likely be addressed through spending cuts for other needs. Governments could increase revenues, but they face political and economic limits to doing so. Also, some revenue policies that a government might employ in its climate response, like carbon taxes, can reduce the revenue base over time, putting even greater pressure on budgets and the need for difficult trade-offs. We can address climate change without increasing poverty and inequality, but we will need to work on multiple fronts concurrently (as flagged in this blog series.) We need to consider how to raise greater domestic resources in developing countries without increasing the burden on poor communities, how to change the prevailing public finance frame to place more emphasis on equity and inclusion and how to promote and support deeper and broader civil society engagement in decision making and oversight to counter the powerful corporate voices for the status quo. Climate finance is clearly a game changer, but can we change the nature of our game in response? Can we leverage climate finance to make serious inroads into poverty and inequality? Fiscal Futures: Can We Turn Tax Competition into Tax Cooperation?